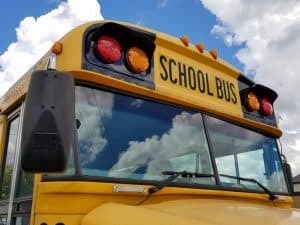 A Child Died in a School Bus Crash, but ND’s Supreme Court Won’t Lift the Damage Caps | Larson Law Firm P.C. In January of 2015, a school bus carrying 13 children stopped on a railroad track. It was hit by a BNSF Railway train. As a result of that crash, the driver and 17-year-old Cassidy Sandstrom died, and ten other children were sent to the hospital. The North Dakota Insurance Reserve Fund set aside $500,000 to cover all of the damages from the crash. It was not enough. Nine sets of parents filed a lawsuit, claiming that North Dakota’s damage caps should be deemed unconstitutional in this case. In their motion for summary judgment, they claimed “that at the time of the accident, the bus driver was a School District employee acting within the scope of his employment, that the bus driver’s negligence was the sole proximate cause of the accident and the injuries, and that the total damages from the accident would exceed three million dollars.” When their motion was denied, and the judgment was found in favor of the defendants, those same parents appealed to the Supreme Court of North Dakota. We recognize the aggregate damage cap for claims against a political subdivision may not afford all claimants complete or perfect relief for multiple catastrophic claims from a single occurrence. While we sympathize with those who have suffered a catastrophic injury and loss, we agree with the Pennsylvania Supreme Court’s rationale that the competing policy considerations involved with establishing damage caps for political subdivisions are legitimate considerations for the legislative branch. In our view, the establishment of the aggregate statutory damage cap at issue in this case represents a core legislative function with a sufficiently close correspondence to the legitimate legislative goals of providing affordable liability insurance for political subdivisions within applicable fiscal constraints. The opinion may as well have said “too bad,” for all the empathy it shows. Larimore is a small town in Grand Forks County. Its public school serves 400 children. If the 2010 census is correct, there are around 1,300 people in the city. We are fully aware of the financial constraints that small towns and cities face. As injury attorneys, we are also fully aware of the laws in place governing damage caps. Still – that doesn’t mean we have to like them. And it certainly does not mean that we will not continue to fight against them. The blatant disregard for the safety and well-being of our children is chilling. School buses bring kids to and from school, yes – but also to and from sporting events and extracurricular activities, and on trips to museums and statehouses. Every parent in this country now has to wake up every day and wonder if their children will be victims of a school shooting; must we be concerned about the bus ride, too? If our children are injured while under the care and supervision of a school district employee, is it too much to ask that that the responsible parties be accountable for those injuries? The case was judged and the law was upheld, but from where we are standing, there are no winners here. Only our legislature can fix this. We need to demand that the law be changed to protect our children. Larson Law Firm provides honest, practical guidance on behalf of injury victims throughout North Dakota. If you or your loved one was hurt in a crash, we may be able to help. Please call our office in Minot at 701-484-HURT, or fill out our contact form to schedule your free consultation with an experienced North Dakota injury lawyer today.